Are you experiencing “ERR_SPDY_PROTOCOL_ERROR” Error on Google Chrome, then please try the solutions below. The fixes mentioned here will fix and get rid of the Chrome error in browser. The post has the best consolidated solutions from many websites on how to fix this error in Chrome Browser by doing the steps one by one and you can easily visit popular websites like Gmail, YouTube, Facebook, Reddit, wikipedia, 4chan, reddit images and Tumblr once this error is complete gone. The 'err_spdy_protocol_error' is caused by a SDPY web protocol used by Chrome browser. It is not the fault of your computer or internet connection. What we need to do is to fix the SDPY sockets to clear the problems with Data server of Google Chrome. You can access Reddit by flushing Socket Pools and access Gmail and Facebook by flushing DNS using command Prompt. SDPY Protocol pronounced as speedy is an deprecated application-layer protocol to reduce in page load times in Chrome Browser and to auigment HTTP requests. Basic features of SPDY protocol are Multiplexed streams in a single TCP connection, Request prioritization to assign a priority to each request and HTTP header compression to reduce size of packets and bytes transmitted. Google removed SPDY support from Google Chrome 51 versions and up. Do the following one by one. If the first solution works, then no need to go to second solution. Keep doing each one and see if any of it are working. Chrome Cleanup tool will scan and remove software that may cause problems with Chrome, such as crashes, unusual startup pages or toolbars and unexpected ads you can't get rid of. This is the latest update on fixing 'ERR_SPDY_PROTOCOL_ERROR' in Google Chrome. Press CTRL+H. Press CTRL and H togther at the same time. You can also paste chrome://history/ in chrome tab and press enter. You can also copy the command chrome://settings/clearBrowserData, paste in new tab in chrome and press enter to access the same window. Select "The beginning of time". 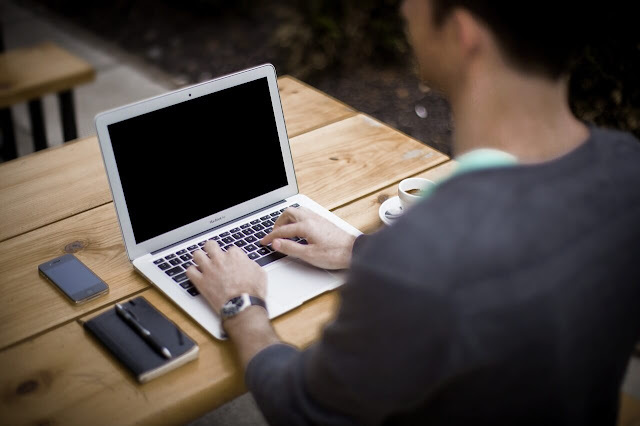 Check the boxes of Browsing history, Download history and Cached images and files. Select "Clear Browsing Data" in the bottom of the window. Open Google Chrome. Press CTRL+SHIFT+N and type the website there and try to load it. If you are still getting loading error, go to the next step. Go to Help, open About Google Chrome and update the Chrome to latest version. You can also copy the command code chrome://settings/help and paste in new tab in Chrome and press enter. Copy the chrome://net-internals/#events&q=type:SPDY_SESSION%20is:active command. and paste the command in a new tab in Chrome. Then press enter. Select the small black arrow in the right side bar. Select Flush Sockets which can been seen under Tools. 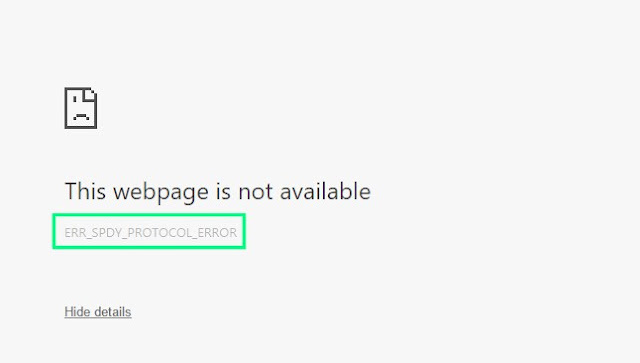 Some users commented that the 'ERR_SPDY_PROTOCOL_ERROR' appears after 1 or 2 days. In that case, either do the following steps in this post or keep repeating this method. Copy the chrome://net-internals/#sockets command, paste in new tab and press enter. Sometimes you may need to Flush DNS and release and renew IP addresses. For that you need to open Command Prompt in Windows and Enter specific commands and press enter. To Open the command Prompt in Windows, press Windows key + R together. Other easy way is to open start menu, type cmd and open command prompt. You can right click on the command prompt icon and start as administrator to get administrator access. Once you open Command Prompt, copy each code below and paste in the window and press enter. Reload the web page after flushing dns and releasing and renewing IP addresses in Google Chrome. This generally Fix “ERR_SPDY_PROTOCOL_ERROR” Error on Google Chrome. Go to Chrome, Settings, Advanced and select Rest Settings. This will reset your Chrome web browser to original state. You can updates Chrome as mentioned earlier and load the web page again. Watch video on How To Reset Google Chrome settings to default. Sometimes the Chrome error: 'ERR_SPDY_PROTOCOL_ERROR' happens, when anti virus blocks the website. You can disable the antivirus like Avast Anti virus, Quick Heal Internet Security, Kaspersky etc. temporarily and check if the website is loading or not. Disabling web protection service. Avast > Settings (Gear icon) > Active Protection > Web Shield (Customize Button) > DESELECT "Enable HTTPS Scanning". Then click OK to all the menus and flush your sockets again. Check method 4 and 5 in this article above. The Managing HTTPS scanning in Web Shield in Avast Antivirus article shows you how to do it. It the err_spdy_protocol_error appears again, uninstall Avast Antivirus and check if web pages are loading again. Now you can visit popular websites like Gmail, YouTube, Facebook, Reddit, wikipedia, 4chan, reddit images and Tumblr without getting the annoying err_spdy_protocol_error in google chrome Web Browser. You can still try to get rid of the problem using other methods mentioned in Fix All Connection Errors on Google Chrome. 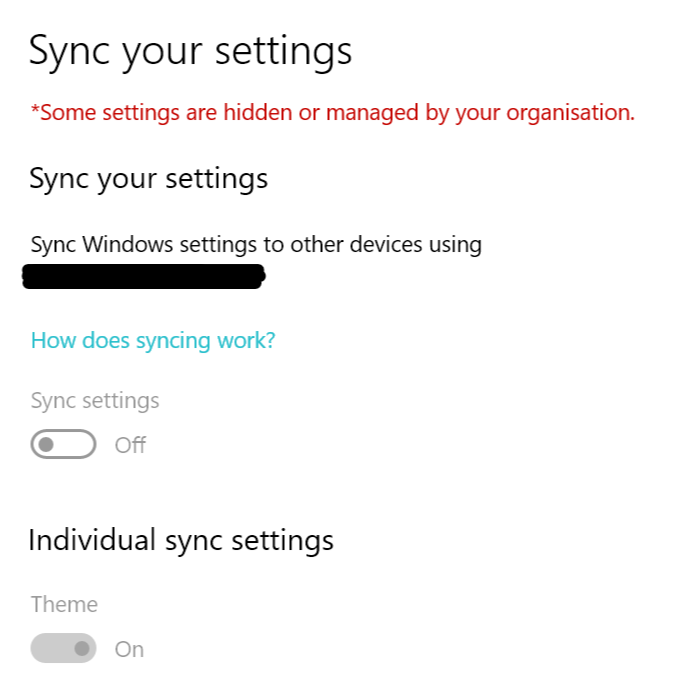 It is easy to fix the Windows 10 sync settings greyed out error. Only 3 steps are needed to solve this sync settings problem. 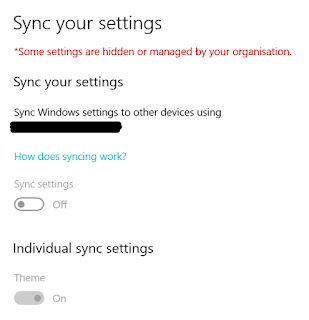 Everyone asked me how to do synchronizing settings in Windows 10 and how to sync settings in windows 10. Let me show you an easy way to solve the error windows 10 sync settings greyed out. In Windows 10, some settings are managed by administrator. Sync settings are needed when you have multiple devices with the operating system. Syncing also helps in backing up the data from could servers and manage data from any other devices. There are multiple ways to troubleshoot the error. It is better to test each one and then move to the next one. It is possible that your Microsoft account is not safe, locked out, password reset etc. Try resetting the password or login with a different Microsoft account. If you do not have a different account, make a new one and login with that. Usually this fix the problem. Once you have login with the new account, try to sync the settings. It is necessary to login with your Microsoft credentials like username and password. Otherwise the syn settings will appear as greyed out. Disable antivirus for sometime and run with windows defender. Group Policy has been set to manage settings in all versions except pro version. Disable antivirus and login to the Microsoft account. Go to Start menu, select Settings, select Privacy. Select Feedback and Diagnostics from the left column. Set Diagnostic and Usage data to Enhanced. You can disable driver signature enforcement option by going to advanced start up mode. For that do the following steps. When the computer restarts, press F7 on keyboard. This will select Disable driver signature enforcement. The computer will restart automatically. Wait for the computer to start again. You can also check out how to fix system administrator permission error. Those steps are complex and can damage your computer. Please get help from someone who knows about Windows 10 sync settings. I wont advice you to get a fresh install or reset pc option as of now. If nothing works, it is up to you to decide.